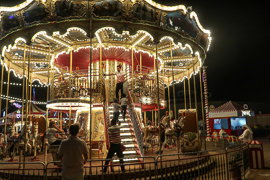 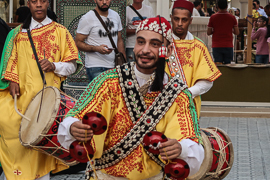 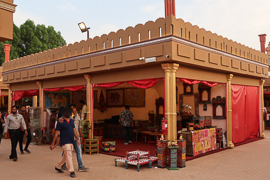 Global Village Dubai – simply amazing! 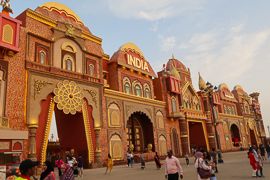 It claims to be the “world largest tourism, leisure, shopping and entertainment project”. 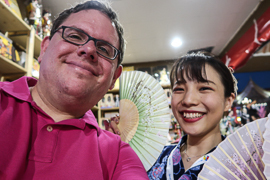 You can get in touch with a lot of different cultures there. 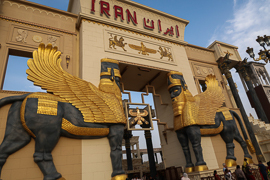 And I always wanted to visit it – unfortunately, it is just opening during the winter months, so it never fitted to my May/June or September/October visits. 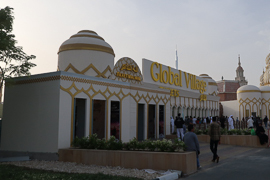 Now, I made it to “Global Village” in Dubai. 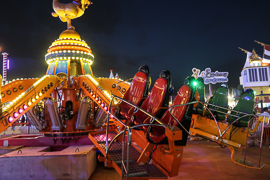 I still cannot really tell you briefly what it is – but can definitely say, it has been amazing. 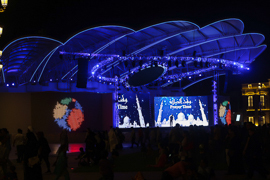 When you try to describe what the Global Village is about, you somehow feel urged to start with Disney World’s Epcot Center in Orlando. 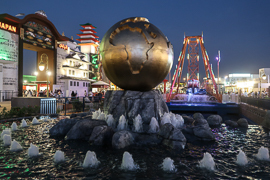 Finally, the only common thing between these two attractions is that you can take a round trip through different regions and countries. 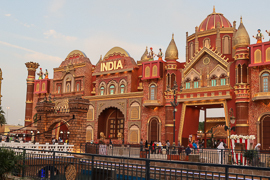 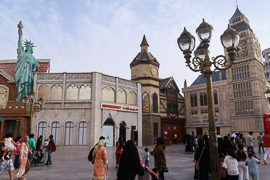 However, Global Village adds much more aspects to your visit than Disney does. 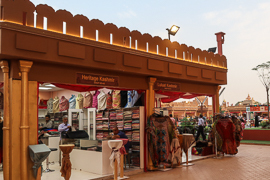 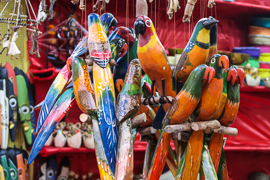 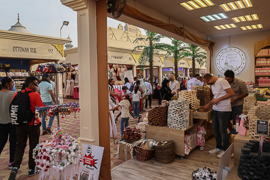 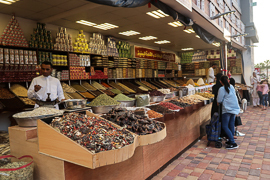 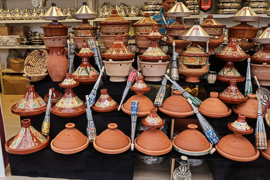 First of all, one of the key components of Global Village is shopping. 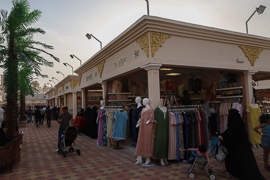 In each region, there is a massive number of original retailers. 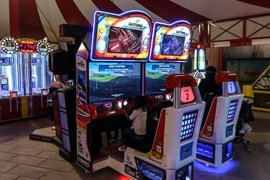 There is a lot of entertainment, on major and minor stages. 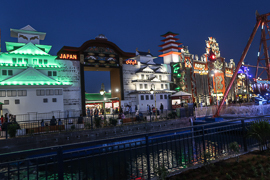 There is also a small amusement park. 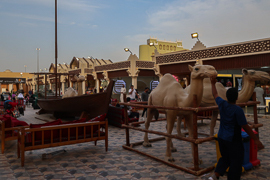 And finally, it is just a place where the locals go to hang out and relax. 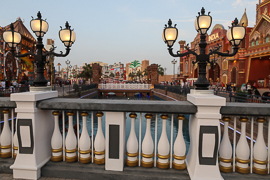 On a weekend (which means Friday and Saturday in the U.A.E. 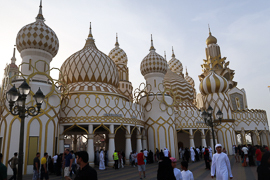 ), you will see masses strolling around or sitting on the green with family and friends. 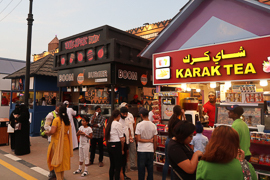 Global Village is located in the Dubailand district. 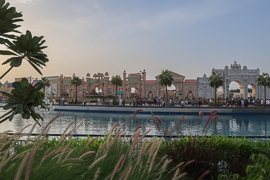 The Dubailand district was thought to become a massive entertainment district. 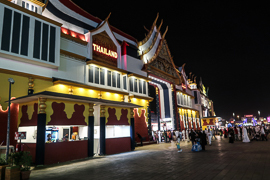 However, only few of the planned projects could really be built. 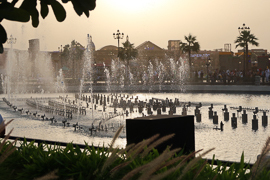 The most prominent ones are the Dubai Outlet Mall close to the Al Ain Road and the Lovely Miracle Gardens. 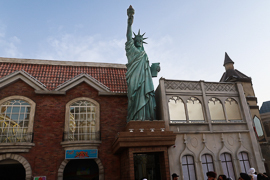 Some have been redesigned – for example, you can see the IMG Worlds of Adventure as a follow-up project of the Marvel Superheroes Theme Park. 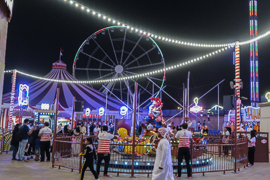 The very different concept compared to amusement parks is also reflected in the entrance fee: the 2018/19 adult admission is 15 AED, which is less than 4 USD. 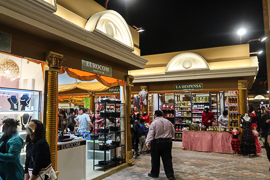 You should spend your money in the stores and restaurants. 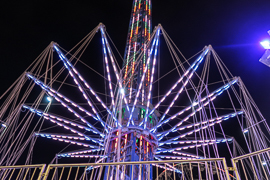 The park opens at 4p.m. 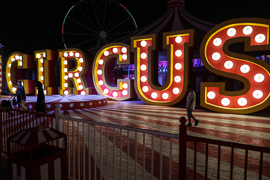 in the winter months – the 2018/19 season roughly ranges from November 2018 to beginning of April 2019. 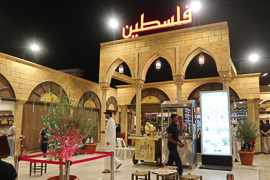 The most intuitive way to feed yourself at the Global Village is likely to visit one of the snack shops in any of the regional areas. 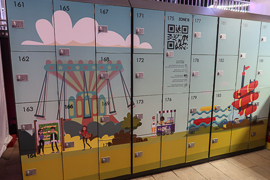 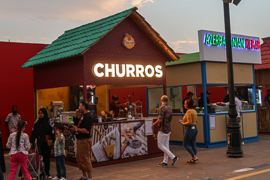 Alternatively, there is also a food court area, which you can split up into three parts: first of all, there is a street with numerous huts selling street food and snacks. 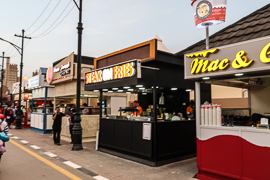 The variety is massive, from Spanish churros, Mac & Cheese, Shrimp Sandwiches or exotics like Azerbaijan kebab. 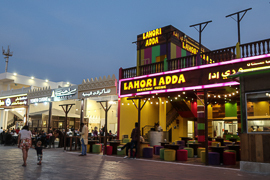 Along another lane, you will find a series of restaurants. 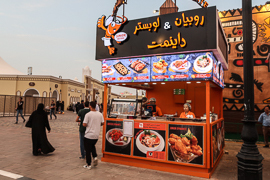 Again, there is some Asian and Arabian dominance, but you may also go for a Bosnian roasted lamb or other rare opportunities. 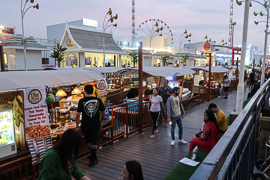 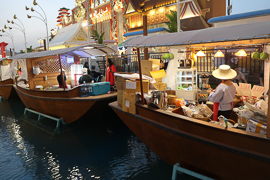 In 2018, the Global Village also introduced some sort of floating markets with food stops close to the restaurants. 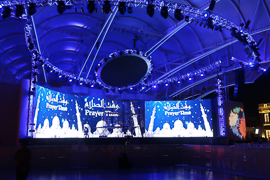 Unfortunately, I just had a look at the main stage (during the prayer break) during my visit – but there is a lot of other stages in the Global Village area. 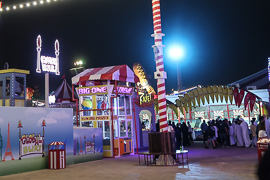 You may even visit a stunt show if you like. 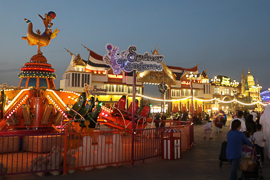 A major entertainment area is Carnaval. 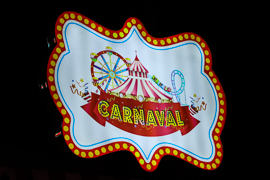 Carnaval is a fun fair area, but there is also a small circus. 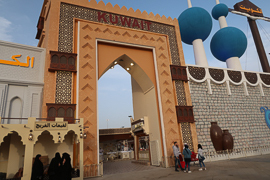 You pay most of the attraction by a prepaid card. 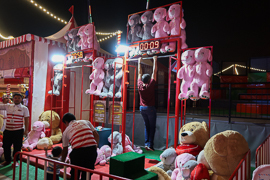 There are some attractions, where you can win prices if you are skilled, but also some really thrilling rides. 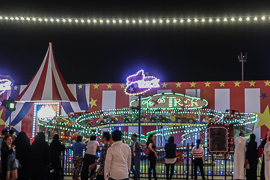 It is not Dubai Parks, but just strolling through the area is already a lot of fun. 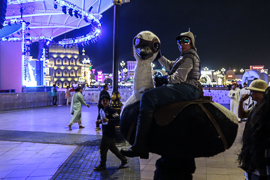 Finally, there are also a lot of performers – and meeting people from the different countries is also not just educative, but also entertaining, ain’t it? 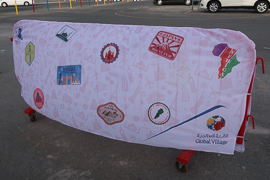 It is so hard to describe what Global Village is – I haven’t any similar concept place in my life. 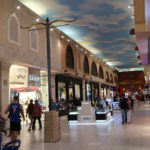 The combination of recreation and shopping is amazing, the area is just huge. 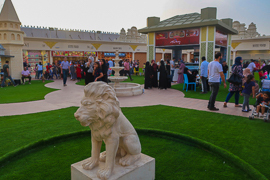 It is not that surprising that the locals storm the area on the weekends. 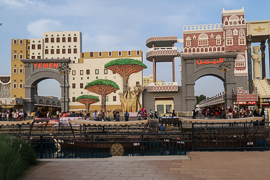 I have visited Dubai and the Emirates a couple of times now – but within the first minutes of my visits, Global Village already stormed on the top of my favorite places in the Mega-City Dubai and even passed Legoland, Motiongate and Bollywood Parks in the Dubai Parks area. 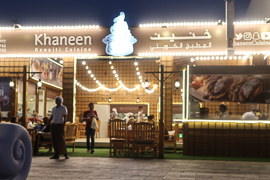 It is definitely a Top Pick! 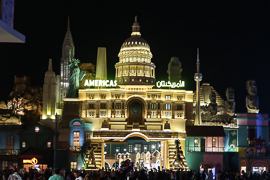 Home » Travel » Travel Reviews » Entertain & Relax » Global Village Dubai – simply amazing!